But he was fascinated with machines. Eventually, he built a machine that helped change the world. 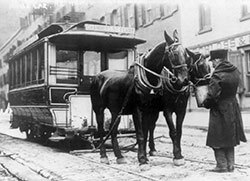 By 1800, horses had pulled carts on tracks for nearly two hundred years. Moving the wheels on tracks cut down on friction. The horses could pull more on tracks than they could pull on a dirt road. But no one had ever moved the carts with an engine instead of horses. 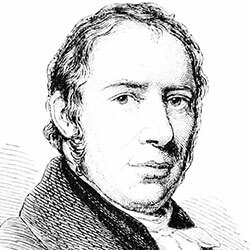 Richard Trevithick thought he could. He put a steam engine on wheels on tracks at the PenyDarren Ironworks, and made a locomotive. 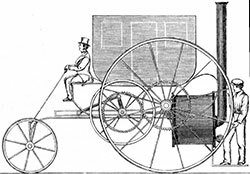 In 1804, his boss at PenyDarren bet a thousand guineas that the locomotive could haul ten tons of iron along a tram road. After that, more inventors used steam engines to make things move. 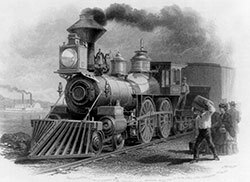 An American put a steam engine in a ship in 1807, and started carrying passengers on the Hudson river from New York to Albany.3 In 1825, the English opened a rail line to haul coal from the Darlington coal mines. The Stockton-Darlington line was the first commercial rail line in the world.4 The French built a line in 1830; the Germans, in 1835. 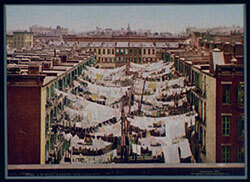 Railroads and steamships changed the way people lived. 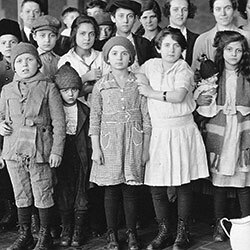 People could buy fresh milk and vegetables that the trains transported from faraway places. They could visit faraway places, too, or live in the country and "commute" into the city by train. 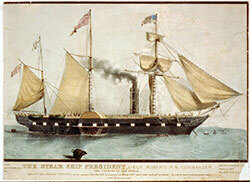 Steamships made it possible for millions of people to come to the United States from Europe. In the 1860s, two railroad companies built a line across the country. Now Americans could ride from New York to California, all by train! Trains changed the way that people traveled in cities, too. 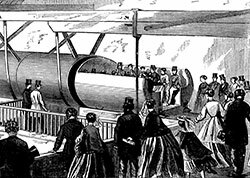 An inventor named Alfred Ely Beach wanted to built a subway in New York City, to make travel there easier. The government wouldn't let him, so he built it in secret! His workers started in the rented basement of a clothing store. They tunneled four hundred feet in two months. Cities around the world built electric rail systems. Subways opened in London, Paris, Madrid. New York City built a subway that became one of the largest in the world. 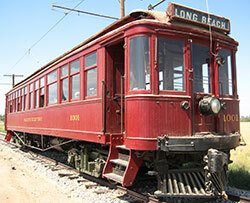 But even as new trains were built and new train lines opened, another form of transportation was becoming popular. It hadn't existed when Alfred Beach dug his secret subway tunnel in New York. 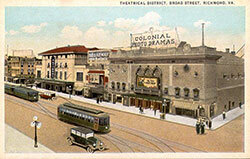 Now it was getting better and cheaper every year, and would change the way people traveled all over again. The invention was the car.